I was all geared up to visit Nia Cafe for one of their delicious brunches on a rare Sunday morning "off duty" in Brighton. 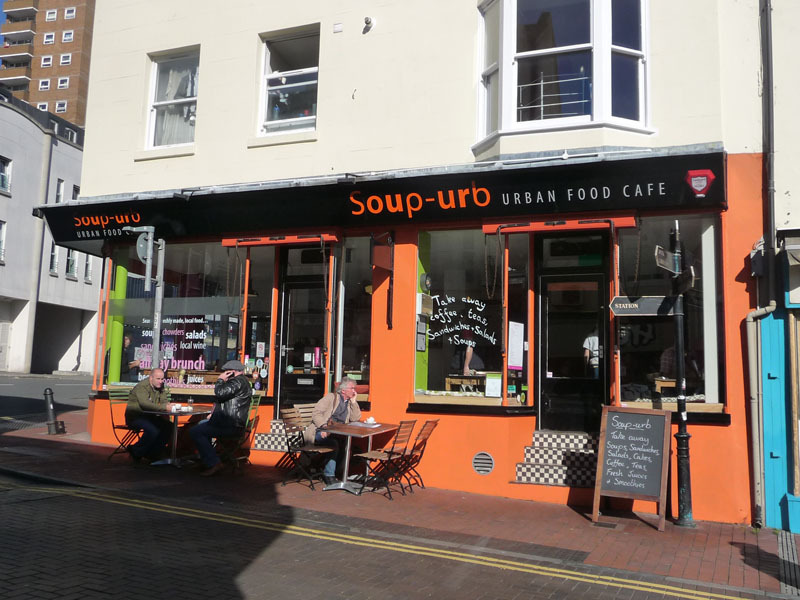 But when I turned up I found it had changed to something called..hold on to your hats...Soup-urb. Along with the pun-tastic name, the slightly nauseating strapline and the elecro facade almost made me turn right back round again if I'm honest. And anyway I wanted flipping brunch not soup. On closer inspection the menu did extend beyond the name of the place. Let's hope others don't assume this is a one trick pony either. Branding people, branding. Once inside I couldn't see too much change from the previous Nia interior apart from some more garish colours but the menu is actually pretty good here. Brunches are your usual full-ons and things on toast. I liked that there were boiled eggs with Marmite soldiers for the young and the young at heart. 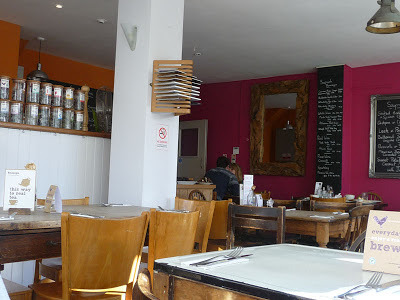 Although here for the brunch, the soups seemed inventive and inviting (Mexican Bean & Coriander Yoghurt, Smoked Haddock, Bacon & Spinach Chowder, Sweet Potato, Chilli & Coconut Milk) and there was plenty of choice for salads and sandwiches (Smoked Mackerel and Beetroot, Belly of Pork & Bramley Apple, Chicken, Tarragon and Pancetta Mayonnaise) with lots of local, seasonal produce. 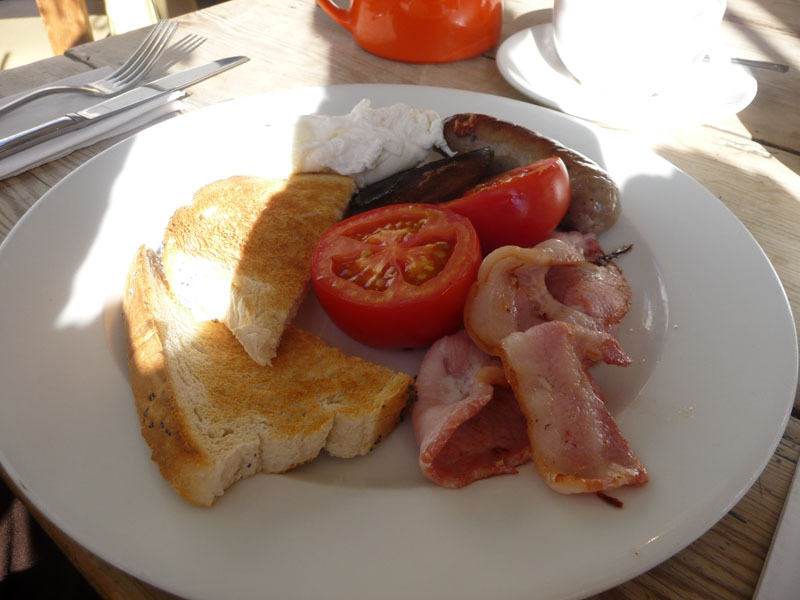 They are also quite keen on the environmental impact of the business and special dietary requirements too. And actually, when I'm at work I often fancy a soup for lunch, especially during the cold snap season. Handily it's not too far at all from the studio and I can't think of anywhere close that has this range of daily changing flavours to keep you interested. I'm looking forward to seeing if they taste as good as they sound. 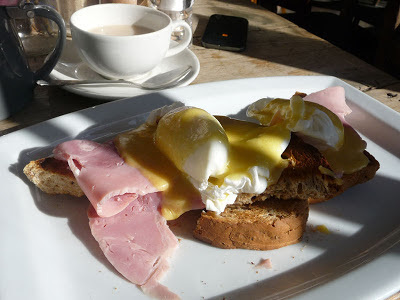 Anyway, I really enjoyed my Eggs Benedict (£5.75) and the full English Breakfast (£8.50) was good too. I would have preferred some thick, home-cooked and hand-cut ham but that's a minor grumble, especially when considering the price. There is a huge seperate Tea Pigs menu, served in those funky Stump teapots as well as quality branded bottled juices, beers, wine and freshly made smoothies. Prices are reasonable and staff were really lovely and friendly. Although I'm sad to see Nia gone, I think Soup-urb, branding aside, is a decent replacement and you couldn't go too wrong for a lunch or a brunchtime visit here.